(L-R) NSW Waratahs players Karmichael Hunt, Curtis Rona, Kurtley Beale, Israel Folau and Adam Ashley-Cooper. 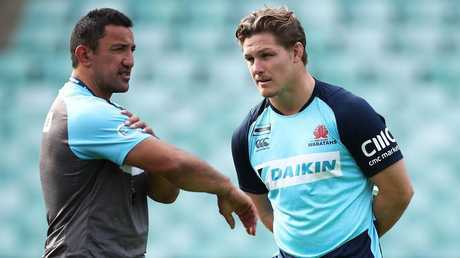 Having a stacked squad with more Wallabies than any other Australian Super Rugby team is the blessing and the curse the Waratahs will have to cope with this season. 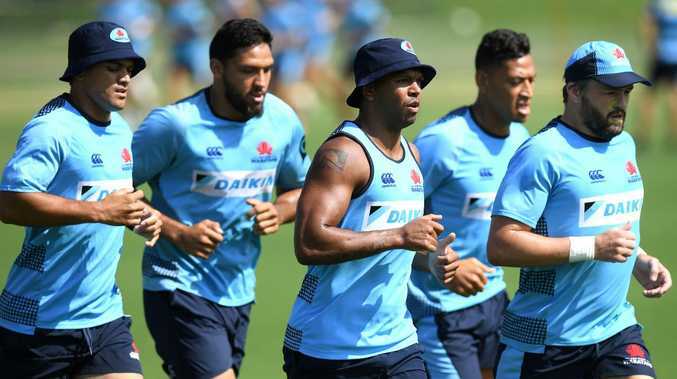 When their big guns are all playing and firing at the same time, the Waratahs will be a formidable force for any opponent and could well challenge for the title. But therein lies the rub. With so many international players at his disposal, coach Daryl Gibson's biggest challenge this season will be how he manages them all, maintaining stability in his own team without burning them out ahead of the World Cup. "We're very capable of making the playoffs but it's a case of forging that identity about how we want to play the game and getting the best out of the players," Gibson told The Sunday Telegraph. "We have a few more constraints this season in making sure we rotate our squad and not play our best players too often. "We want to get to the final stages but making sure we have a little bit more gas in the tank." The Waratahs faced the same problem last season. 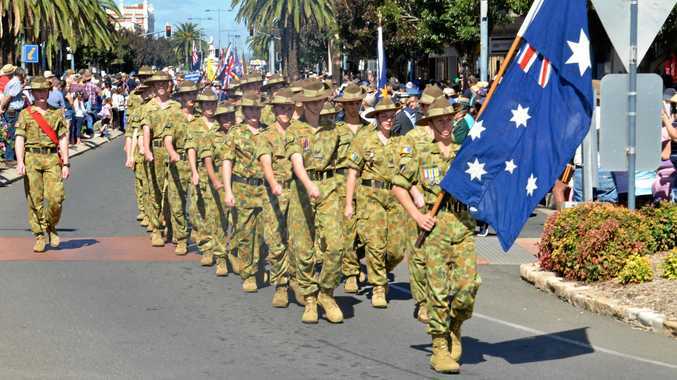 By any measure it was a successful year as they topped the Australian conference and went on to reach the semi-finals, but it came at a price with key players, notably Bernard Foley and Kurtley Beale, running on empty by the time they swapped their sky blue NSW jerseys for Australian gold. That's part of the reason Gibson went shopping in the off-season and beefed up his side with Adam Ashley-Cooper, Karmichael Hunt and giant South African lock Le Roux Roets. "I think our depth is better this year - lot better across all positions so that's really a bonus," Gibson said. "We're starting the year with high expectations but the key is how we maximise the best out of the squad." To do that, Gibson has made some important changes to his off-field team as well, bringing in Chris Whitaker as backs coach and Welshman Steve Tandy as defensive coach, while retaining Simon Cron (forwards). The Waratahs had the third-best attacking record of the 16 teams in Super Rugby last season but had the worst defensive record of the eight teams who made the playoffs, conceding 59 tries - so it's no surprise that's the main area of concern right now. "A big focus for us this season is around our defence and making sure that we are tougher to break down," Gibson said. "Last year we felt that we conceded too easily at times so while we need to concentrate a lot on our attack, the most important area we need to improve is to really stiffen that defence." The Waratahs face a baptism of fire in their opening match against the Hurricanes at Brookvale Oval next Saturday but, if they kick off with a win, it will set them up nicely for the season with a favourable early draw - including two matches against the Sunwolves who were last year's wooden spooners. "It's a tough opener against the only team that's been in the top four for the last four years, so we know we're going to have to get to it pretty quick," Gibson said.